Fits 1996-00 7.4 V8 Vortec engines. Includes everything you need to Super Tune your pickup truck, van and SUV! 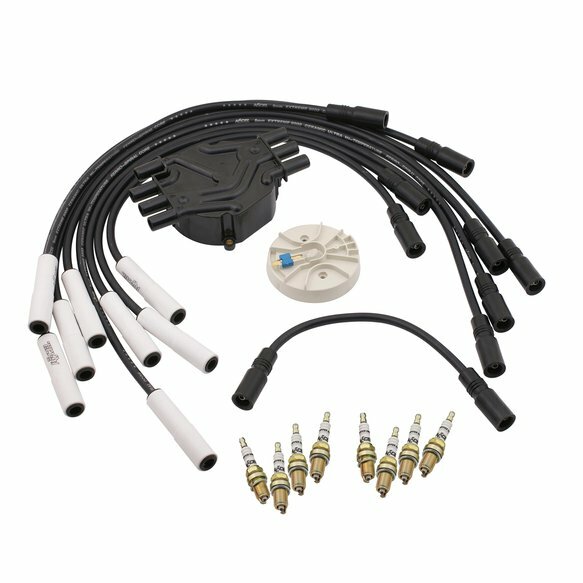 All kits consist of matched ACCEL custom fit wire set, ACCEL distributor cap & rotor and get the ACCEL U-Groove spark plugs...FREE. Kits include 8mm custom fit Extreme 9000 wire set with Heat reflective Coat sparkplug boots rated at 1200 degrees F, and Ferro-Spiral core. Some in-line 6cylinder applications use 5000 series wire set where extreme heat is not a problem. ACCEL uses the finest distributor cap and rotors available; precision molded in impact resistance high dielectric strength compounds. Most applications in tan with brass or copper inserts and stainless steel contact springs. Renowned, race-proven U-Groove copper core spark plugs are used to maximize burn efficiency for improved performance and reduced emissions. * Kits designated with the suffix HP are available with ACCEL Shorty Header Spark Plugs for added plug clearance on vehicles equipped with headers.